With the term polymer, we intend usually a repetitive structure of the type (-XY-)n where XY is the so-called monomer unit, or repeat unit, and n is the so-called polymerization degree. The monomer unit derives from a reactive chemical compound, capable of polymerization, for example poly(vinyl chloride), PVC, derives from vinyl chloride CH2=CHCl, thanks to the opening of the double bond which leads to the sequence -CH2-CH(Cl)-CH2-CH(Cl)-CH2-CH(Cl)- etc., shortened as [-CH2-CH(Cl)-]n.
Figures from 1 to 6 give an illustration of natural and synthetic polymer structures. 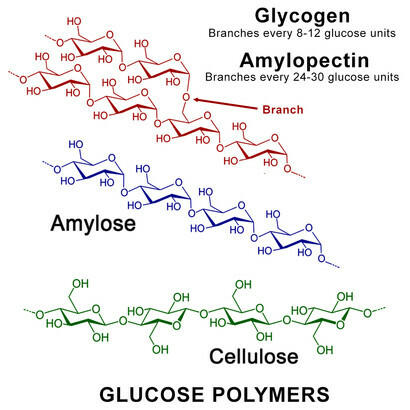 The polymers occurring in nature (see figures 1 to 3) are proteins, nucleic acids (DNA and RNA), cellulose, starch (consisting of 20 to 25% amylose and 75 to 80% amylopectin), glycogen, caoutchouch, silk, wool (the latter two being also proteins). 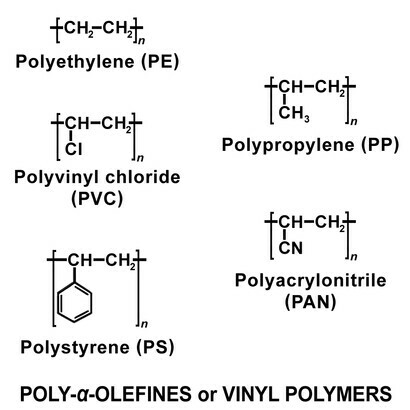 The most familiar synthetic polymers (see figures 4 to 6) include nylon, polyethylene, polyester, polyvinyl chloride, polytetrafluoroethylene (better known as Teflon), and epoxy. 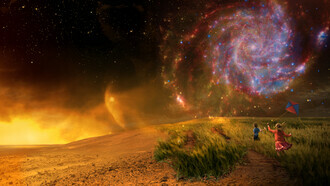 Why had nature to resort to long chains in order to achieve life? 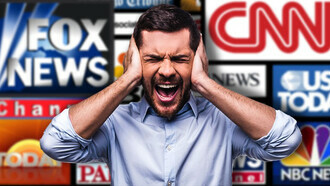 We will dwell on this question in the second part of this article. 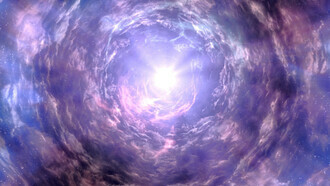 Here, we will consider only the synthetic counterpart, but limiting ourselves to the basic, general concepts. 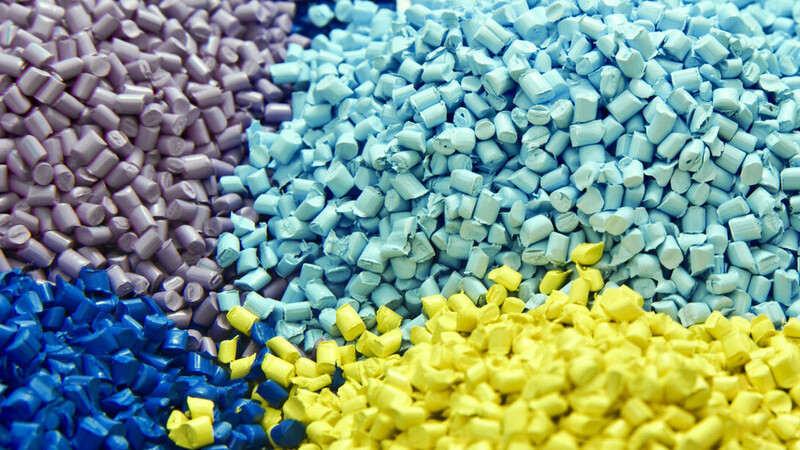 It is difficult to overemphasize the importance of polymers. Let us say that in 2008 the global plastic production was around 245 million tons. If you divide this figure by a population of about 8 billion, you obtain a pro capite value of ca. 30 Kg! Why polymers are so important? The most general, and trivial, answer, is: because they are solid. To understand why it is so, let us take simple hydrocarbons, (molecules made simply by carbon C and hydrogen H), like methane CH4 or butane CH3-CH2-CH2-CH3 up to one of the main component of gasoline, octane, CH3 -CH2 -CH2 -CH2 -CH2 -CH2 -CH2 -CH3, which can be written in a compact form CH3 -(CH2)6-CH3. 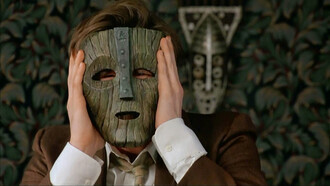 And now, take a wax which is, say, CH3-(CH2)30-CH3. Well, see figure 7: at normal conditions (n.c., i.e., room temperature, normal pressure, and so on), methane, butane, are gas; hexane and octane, somewhat longer, are liquid; but waxes, which are much longer, are solid. So: by increasing the length, I have changed the physical state. And longer chains tend to be solid! Why is it so? This is due to intermolecular interactions. These can be envisaged as mutual attraction forces, and to better understand this, consider that these hydrocarbon molecules, although not polar, have clouds of electrons around their atoms, which are in continuous movement, determining dynamic, momentarily charge fluctuations, which tend to mutually attract the molecules to each other – the so-called Van der Waals forces. In the case of methane or butane, the molecules are so short, that the attractions forces are weak, and the molecules then tend to remain isolated, in the gaseous form. In the case of hexane or octane, instead, the intermolecular forces are strong enough to hold molecules partially bound to each other – the liquid state. And when we go to very long chain, we have then the solid state. 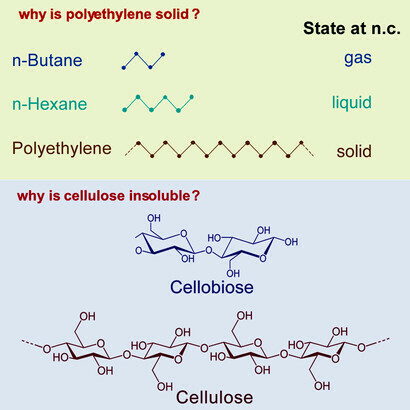 From figure 7, you can see how the same principle applies to cellulose (a very water insoluble material) vis a vis the dimer cellobiose, which is well water soluble just as sucrose (also a disaccharide). In this case, the intermolecular interactions are mostly the so-called hydrogen bonds. This is why polymers are important, but it is not all here. Notice that I said “solid state” – I didn’t say “crystalline state”. In fact, long polymeric chains do not form crystals. The probability that these extremely long chains of, say, poly(vinyl-chloride), poly(ethylene), nylon, poly(butadiene), etc., are going to be regularly arranged into a crystalline lattice, is extremely low. The greatest part of the chains will be present in a disordered, relatively mobile state – we say that they are mostly amorphous, meaning with that a non-crystalline state of solid matter. Like the common glass, which some authors consider as a frozen liquid state. Far from being a problem, this lack of crystallinity is the most important advantage: the “plasticity”, the fact namely that the material can be bent and is capable of assuming all forms. In addition, of course, to the other general properties of a polymer, namely a low cost, low density, and a high mechanical strength-on which we don’t dwell here. Instead, let us say two words more about the notion of “glass” mentioned above. Yes, a polymeric material usually has plasticity, due to its large amorphous regions. But if we lower the temperature, down to the so-called glass temperature (a value characteristic for each polymer), then the relative chain motions stop, and instead of a plastic material we have a glass, namely something rigid, brittle and fragile. Thus, polybutadiene is a good rubber at room temperature, but if you bring polybutadiene tires below -80°C, it becomes a glass – not a good rubber! And take the example of polystyrene, which has a glass temperature of about 80°C: the material is “plastic” above this temperature, but becomes rigid and brittle below it. From figure 8 a couple of other important general features of synthetic polymers. The percentage of crystallinity – which in turn is related to the mechanical performance – is greater when the chains are linear, while it decreases if there is branching. Branching in indeed another chemical parameter that can be manipulated and can influence the melting point, the solubility, the thermal stability. And from the same figure, notice the pictorial representation of rubber elasticity. Millions of tons of rubber are produced yearly (27,776 thousand tons in 2015) for tires, panels, toy articles and all other kind of elastic material. The chemical trick to impart rubber-like properties to the material is cross-linking – namely covalent intermolecular bonding. 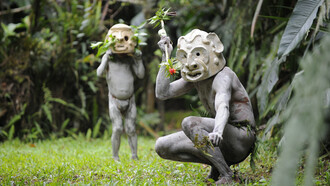 Rubber can be found in nature and harvested as a latex (milky liquid) mostly from Hevea brasiliensis. Natural rubber coming from tree latex is essentially a polymer made from isoprene units. Synthetic rubber can be made mostly poly (butadiene), which has the structure [-(-CH2-CH=CH CH2-) CHn]. The chemical difference between the two monomers is an additional methyl group in isoprene, see figure 3). The most common process by which cross-linking is the vulcanization, the chemical process in which individual poly(isoprene) chains are covalently linked to each other, usually with Sulfur. By stretching, the material can elongate-but when the stretching force stops, the cross-linking acts as a calling-back force, and the material tends to go back into its original length. 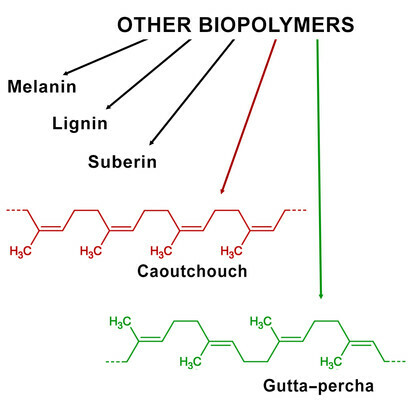 Notice from figure 3 the strong structural analogy between caoutchouch and gutta-percha, which is also a natural product. But notice also the structural difference around the double bond, in particular the “trans” configuration of the double bond in the case of gutta-percha brings to a higher “stereoregularity” and higher crystallinity, so that this material cannot become a gummi. And from figure 2 you can see another admirable example of the importance of stereoregularity, the difference between starch (made of amylose and amylopectin) and cellulose. The first, is our best nutrient; cellulose instead, because of its particular configuration of bonds, cannot be digested by humans. Synthetic rubber is preferable over the natural one, because chemically different monomers can be mixed in various proportions resulting in different products with a wide range of physical, mechanical, and chemical properties. This is another very important chemical parameter in the creation of synthetic polymers in general, the copolymerization. A copolymer is a polymer consisting of more chemically different repeat units in the chain, and this variability can offer a powerful tool to modify the properties. 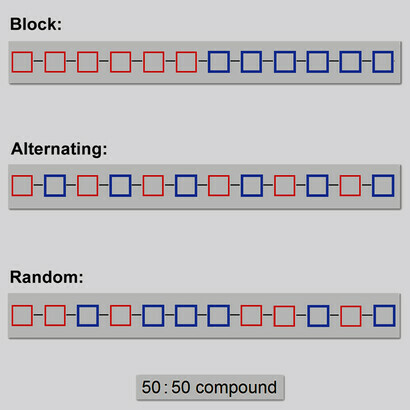 There are different ways to do so, as exemplified in figure 9. For example, common rubber tires are not very stable in oily environments (as in airports), but if you make poly(butadiene) with a certain number of polar residues in the chain, then this gummi will repel oil; if you instead insert in the chain styrene units, then the gummi will gain mechanical stability (although losing somehow elasticity). 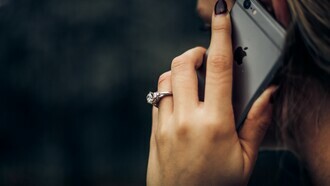 Poly(ethylene) is not usually a good coating for metals, but it may become so in the form of a copolymer containing units of carboxylic acids… and so on. 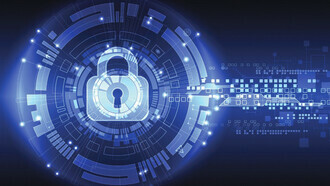 In conclusion, the preparation and processing of synthetic polymers permits a large series of manipulations. In this short assay, we have mentioned linearity, crystallinity, stereoregularity, branching, cross-linking, glassy state, copolymerization, but we can also have polymer blending (you can mix more polymers with each other), and also doping with low molecular weight components, so that it is in principle possible to formulate a priori a receipt for any set of desired properties of the final product. This, in addition to their low cost and low density, this the main key of success of “plastics”. The negative side is in the poor recyclability of the material, indeed very few of the synthetic polymers are biodegradable. This problem is no doubt one of the most important research directions for the future. Continues on the 23rd of July. 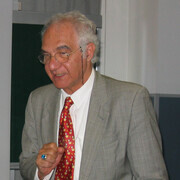 Pier Luigi Luisi took a degree in Chemistry at the Scuola Normale Superiore of Pisa, and held internships in the USA and the Soviet Union. He has been carrying research into the mechanism of enzymes, and the self-organization and self-reproduction of synthetic and natural systems. Biopolymers, existing and extracted from nature, include many molecules. 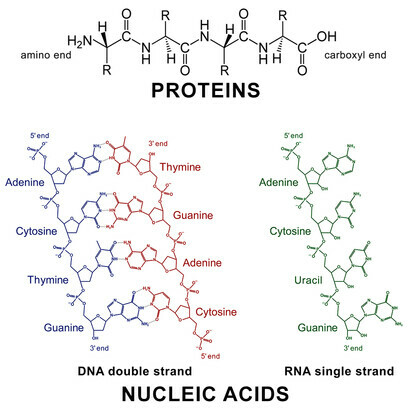 In this panel are shown the polymeric structures of proteins and nucleic acids. Natural polymers include the polysaccharides also. Here, the structures of some glucose polymers are shown. Among many other biopolymers, some interesting examples are shown in this panel. 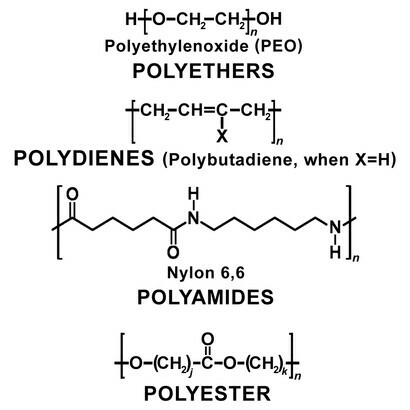 Typical synthetic polymers (polyethers, polydienes, polyamides, and polyester). 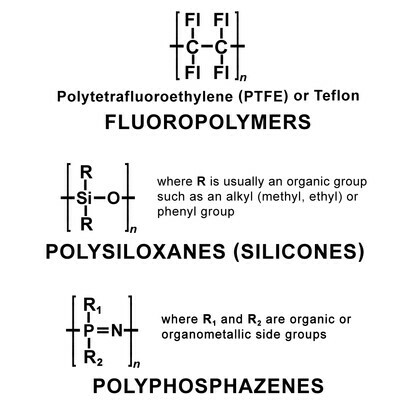 Typical synthetic polymers (fluoropolymers, polysiloxanes, and polyphosphazenes). Two interesting questions regarding how the length of the chain determines the physical state and the solubility. General principles of macromolecular chemistry. Main structural parameters for the regulation of the physical properties of polymers. 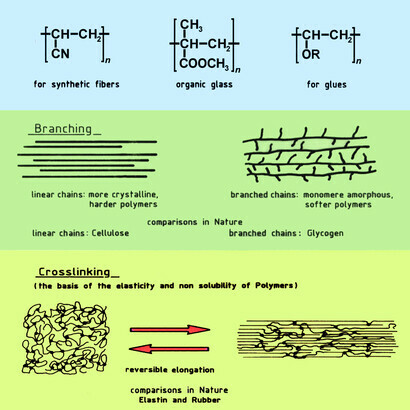 Linearity and branching (which decreases the tendency to crystallinity) and intermolecular cross-linking (responsible of rubber elasticity). Possible types of copolymers, in the case of two different monomer units (blue and red in the figure). The physical and chemical properties will be different, even if the chemical composition is the same (e.g. 50% of each).